Like the Eagle, the Hawk is a bird of Valor and Honor. It soars high in the skies as a representative of the sun deities and is a symbol of power, passion, and energy. Hawks are formidable hunters, thanks to their keen eyesight, impressive depth perception, and whip-sharp intellect. For these reasons, they became one of the companions of choice for skilled hunters and have been mankind´s old hunting partners for thousands of years. The ancient sport of falconry is still the sport of choice for noble statesmen, as such, the Hawk (as well as the falcon) are emblems of nobility, status, and luxury. In multiple traditions across the globe, hawks are revered as the guardians of the souls of the dead via their close association with deities like Charon and Horus. In Native American society, hawks are seen as the embodiment of the souls of long gone ancestors and are given honorary places in the tribe. Most importantly, hawks are renowned for their fighting spirit and Native American warriors firmly believed that appeasing the spirit of the Hawk would make the ancestors happy. In return, the warriors would be blessed with skills that would make them better fighters. It is in this vein that hawks are known as symbols of war. The Hawk´s indomitable spirit has left an indelible mark on human culture. The birds are powerful totems of treasured values and virtues, so a Hawk Tattoo is a great way to show that you are an honorable person. Hawk Tattoos represent power and strength. It is difficult to find one that is drenched in images of serenity and peace. A Hawk is a symbol of war and many artists play up that reputation with images of the bird in a powerful stance. 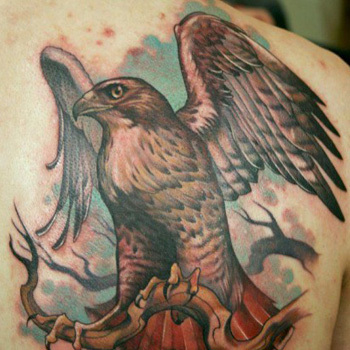 Hawk Tattoos are at their most beautiful when the bird is depicted in flight and if placed over the active muscle groups (like biceps), the design has much more pop and drama. Showing off your fighting spirit with the can be a tricky undertaking, but everyone with an inner warrior should at least consider getting a Hawk Tattoo. The design is full of rich symbolism and brings life and power to your persona. But getting inked is not just about needles, dyes, and your high threshold for pain. The world of Tattoos is enveloped in a sense of artistry and skill, all of which can only be put on full display with a great design. If you need design tips, then take advantage of our Custom Design Service. Our team will be more than happy to help design a truly unique piece for you.